Today I stayed home so I can sort my books and determine which ones I can already let go of and sell. As some of you may know, I will be going through a major operation soon and the funds that will be generated from this sale will be very much welcome. And that is the premise of today's post. Now let's take a trip down memory lane. 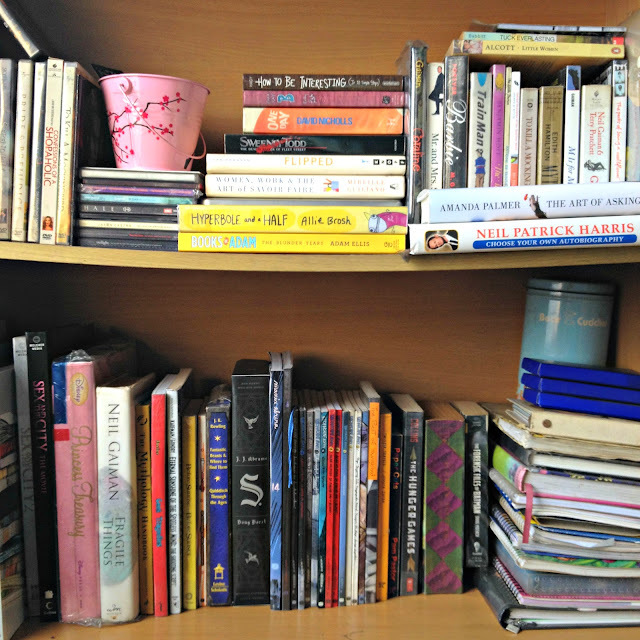 If you have been reading my blog for quite a while, you may remember this photo of my favorite book shelf that I shared on one of my Currently posts three years ago. Unfortunately, this orderly arrangement of books looks nowhere near the current state of this bookshelf. I know I said "I am imposing a rule: eBooks over physical books, unless they come autographed or come in special edition/ full color like those books about movies that I love." but, you know, life, and countless book purchases, happen. I can blame book sales, book fairs, book destashers, bookstores, my Fully Booked Discount Card and National Bookstore Laking National Card, Book Depository, Book Sale, and my enabler boyfriend all I want, but really, all I can blame is myself. In the last three years since I wrote this post I have accumulated more books than my poor bookshelf, boxes, and drawers can hold. Now aside from three shelves, two boxes, and a drawer, I also have at least three tall book towers. The clincher? I haven't even read most of these new books yet. Back to my destashing story... It proved to be a TOTAL FAIL because of all the books in my shelves, drawers, and book towers I managed to choose only SEVEN books I will be willing to part with. SEVEN. I am left with more than a hundred books I can’t find in my heart to let go of. I think I am still holding out for my dream library in my future home. Now I feel bad because I realized the number of books I have yet to read. Sorry for neglecting you, friends! I promise to be a better reader this year. Pick up a random title and try to remember the last time you read it. If you can't recall reading it in the last 12 months, get rid of it. It's a sound idea, yes, but I don't think it will be possible for me to let go of those I haven't read yet, because I need to know if I will like the story or not. It just cannot be done. I guess I just have to make an effort to lessen my time spent in social media and dedicate it to my books, instead. Today was a good day, because I got to finish Doorkeeper by Scott Lee Chua and Ethan Chua in one sitting. I will prepare a more in-depth review but right now I wanted to say that I really enjoyed reading it, mostly because I love when stories are interlaced with other stories. The creators did a great job weaving most of the stories with those we are already familiar with. The art is also great and really helped move the story forward. I think my favorite is the story set in Manila circa Martial Law. The Doorkeeper reminded me of Dream of The Sandman, and I would love for this to become a series of books, too. Congratulations to the authors and artists behind this book! Tomorrow is another day, and I hope I am more successful.